I had a weak moment recently and that’s how I ended up with two hens in my backyard. A friend of mine was having a moving sale and I thought I’d check out her deals. I had already picked out a lamp, a rug, a table, and a sack of polyfil when I passed by a large wooden chicken coop with a price tag that was too hard to pass up. I could feel my heart beating like a drum inside my chest. There is something about chickens that just gets me excited, you know? I have had chickens. I love chickens. I want more chickens. But I’m just not in a place right now where I need chickens, if that makes any sense at all. We’re living back in town and although it’s legal to have a few backyard hens, I’m not properly set up for them. 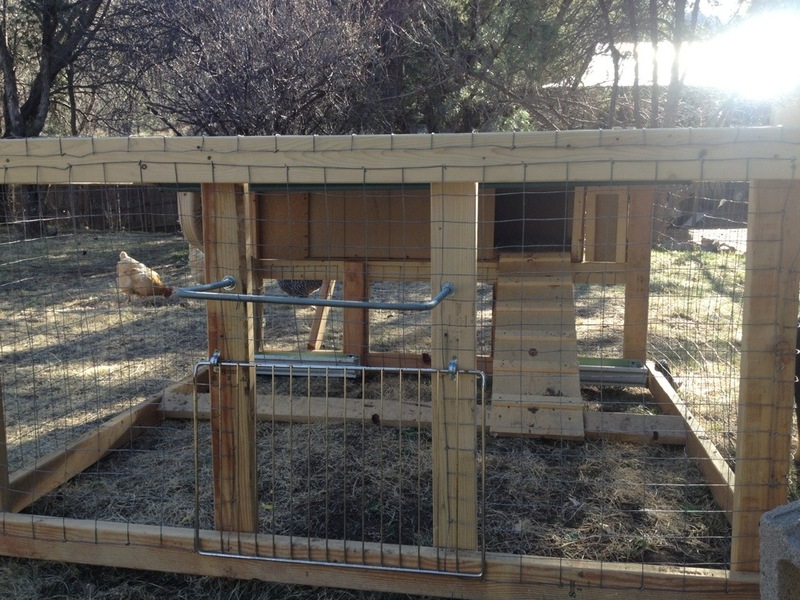 Regardless, I had to have that chicken coop because one day I will have chickens again. If there’s anything that brings me joy, it’s chickens. Before I could even tell her I wanted the coop, she said, “I’ll throw in 3 of my hens too.” She was moving after all and she wouldn’t be taking them with her. My heart exploded at that moment, my mind raced all over. I knew better, I did. I knew better than to agree to 3 chickens. My head was saying no, but my heart was screaming GIVE ME SOME CHICKENS! 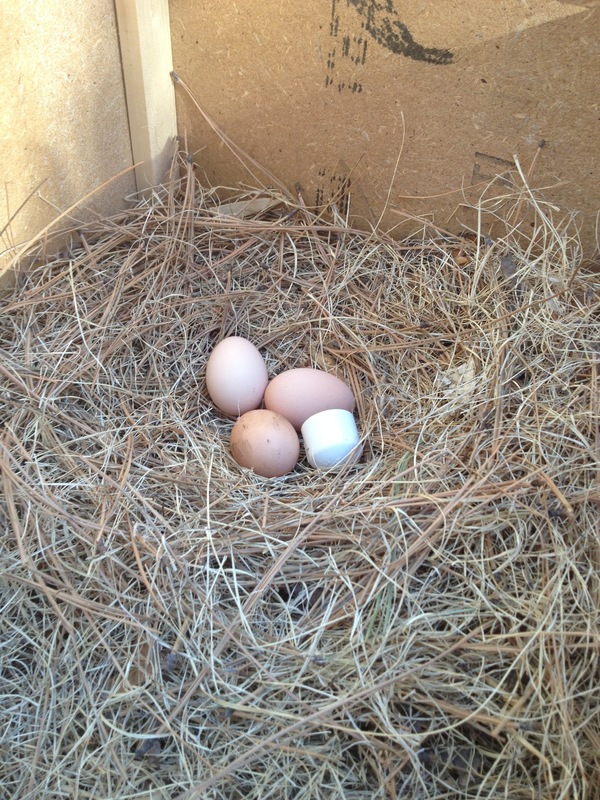 And that’s how I ended up with 2 hens in my backyard. Yes, it was supposed to be three but the third one caught wind of the chicken nabbing during the evening abduction and gave us some fits. I brought those birds home after dusk in a cardboard box and tucked them safely into their new coop. They did fine that night, but the next day they started squalling to beat the band. I went out to check on them because they were so noisy. I carefully lifted the lid of the coop to take just a little peek when the next thing I knew, there was a flap of wings, a flurry of feathers, a caterwauling of clucks and the birds were flying out of the lid, up over my head and were out of the coop and clucking like someone was about to wring their little necks. 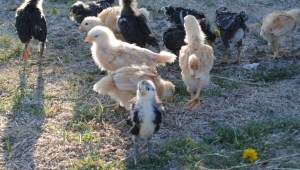 They clucked and squalled for hours until I knew I couldn’t keep these birds. 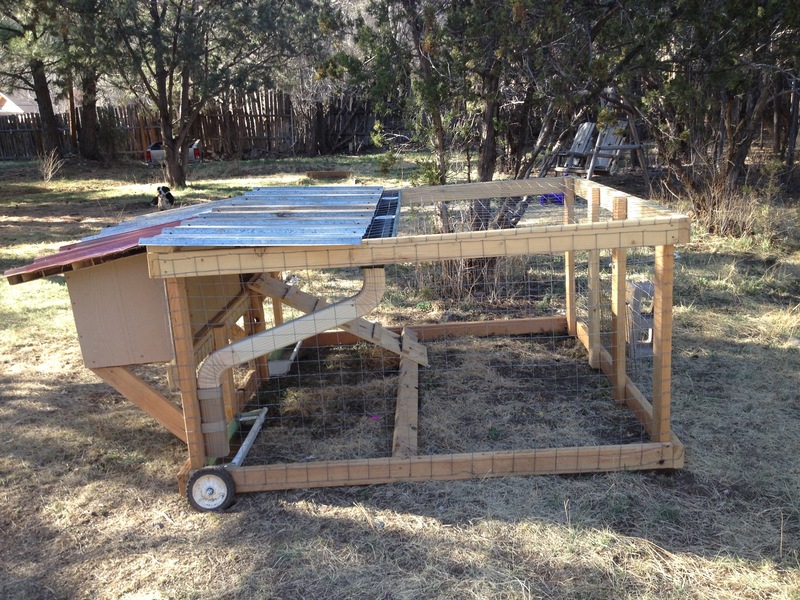 The noise was bothering me, and I knew if the sweet sound of chickens were bothering me, it would only be a short time until the neighbors complained. So I called my sister-in-law, who has a few of her own chickens and she agreed to come take them. She arrived with my 6th grade nephew and a plastic tote to gather the birds and carry them to their new home. Well, they weren’t having any of that. We were running around trying to capture them when the next thing we knew, there was a flap of wings, a flurry of feathers, a caterwauling of clucks and one of the birds was flying up over heads, up over the fence, and into the next door neighbor’s back yard—the home of 3 dogs. I swear I was tempted to just count my losses here, but my nephew wouldn’t hear of it. We left my backyard and rang the door bell of the neighbor to explain our predicament. She graciously let us in her backyard to collect the flyaway. 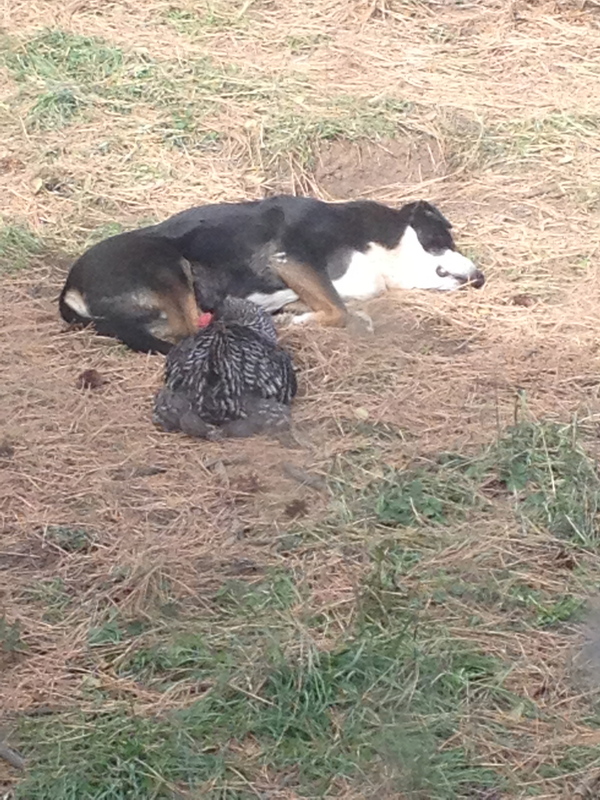 But as for the other one, we decided to let her roost for the night and I would try to capture her in her sleep. So my sister-in-law and nephew headed home to await the call that I had captured the chicken. That call never came. That night she hid under a pile of limbs we had cut down and didn’t even move when I poked her with a stick. I knew she had injured herself in the fray and had crawled under there to die. My plan was to wait until morning and drag her dead body out and dispose of it. The next morning, sure enough, she was out running around the backyard with our dogs Grace and Ozzie, and she had left me an egg under the limbs. Ah, I thought, what a good little chicken, and this one wasn’t near as noisy as the one sent off. I was already getting attached. I tended it that day as best as I could; feeding it watermelon and trying to trick it to go back into the coop. Hopefully it would roost back in the coop and that night I was going to capture it while it slept. That night, it was nowhere to be found. A white chicken shouldn’t be too hard to spot in the dark, but even with a flashlight, I couldn’t find it anywhere. 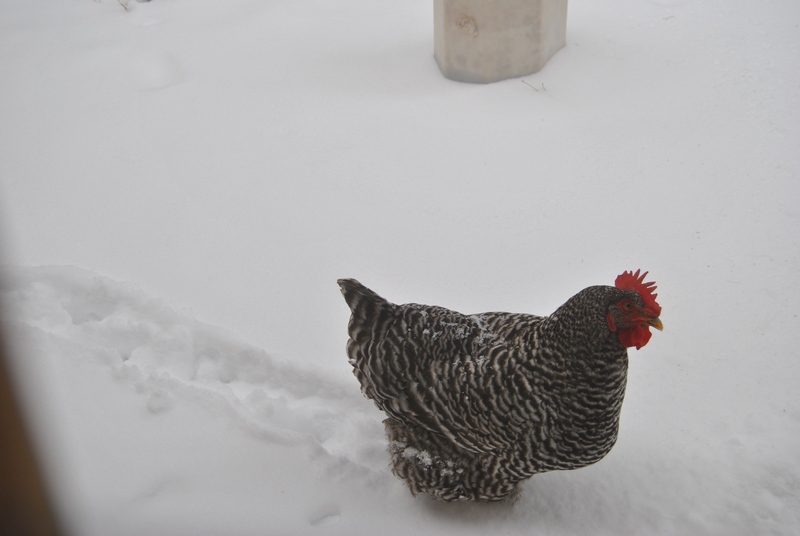 Not under the limbs, not in the coop, not in the trees, not in hidey holes. Well, I figured I’d just count my losses. She’d probably flown over the fence and was dog food by now. I went to bed. 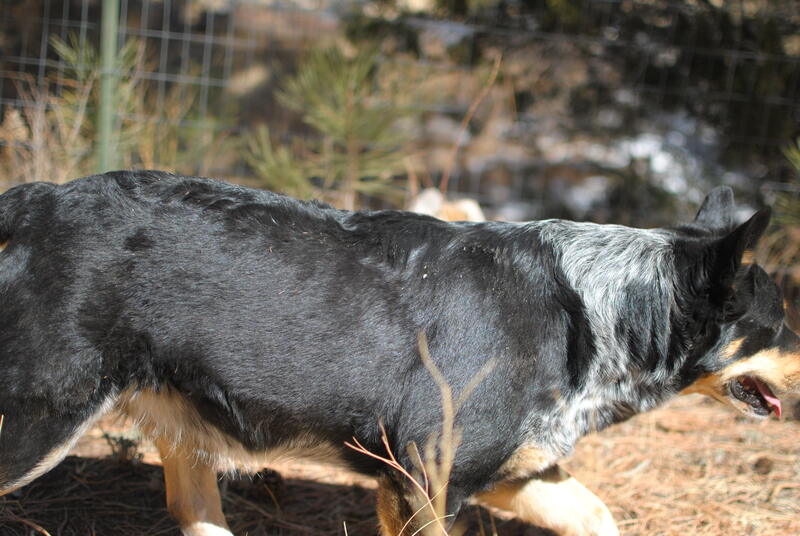 The next day, there she was running around the backyard with Grace and Ozzie again. Okay, you little houdini, tonight you are out of here! 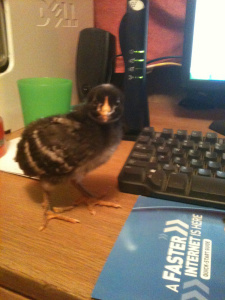 I will not be outsmarted by a chicken! I watched her all day, I watched her like a hawk. I tracked her every move. I fed her watermelon and tried to trick her into going back in the coop. I talked sweetly to her. All she did was run the other direction. That night I was planning to grabbing her up. Dusk rolled in. I went out for the capture. She was gone again. Holy macaroni! Now I was starting to get mad. I looked up to the heavens to curse and that’s when I saw her. Up, up, up–way up—in a tree high above my 5’2″ reach, even on my tippy toes. To heck with it. We’ll just live like this, I conceded. I’d only gotten one egg in 3 days and she wasn’t worth the trouble anymore! It wasn’t 30 minutes later, my sister-in-law and nephew rolled up. They were in the neighborhood doing a little business. I sent him back there to see if he could get that bird. I was standing in the front yard chatting with Janene when the next thing we knew, there was a flap of wings, a flurry of feathers, a caterwauling of clucks and here she came, up over the fence and landed in the front yard with us. And that’s when the chicken chase began. 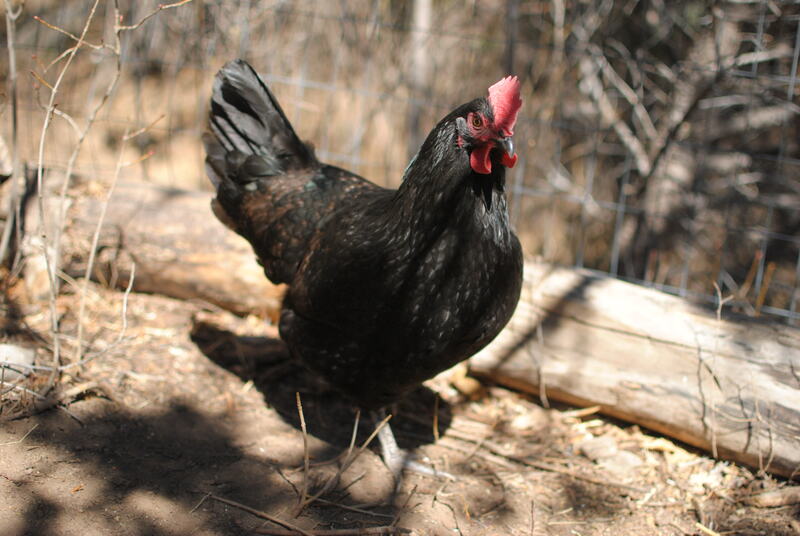 It is one thing to try to catch a chicken in a confined space like a backyard, but let me tell you, it is altogether another thing to try to catch a chicken within a half mile radius. I can’t be done, folks. Wanna guess how I know??? It began with my nephew Harley trailing her down the street. It was hysterical and I ran inside to get my phone to video it. That’s when she ran down the alley. I knew by the way he was yelling “Call in the reinforcements. Call animal control!” that he clearly needed my help. I grabbed a box and began the chase down the alley. We headed her off this way and that. She was back on the side street, then back up our street, then across the road, then under the bushes of many different homes, then back on our street, then up to the next street. At this point SIL Janene and little EK had joined in the chase. It was Harley in the lead, then me, then EK carrying my phone, then Janene in the rear doubled over laughing with a box in her hand. I’m pretty sure a few extra people got a good giggle as they walked and drove by as well. We clearly were not going to be able to catch the chicken in an all out run, so I ran to the house and grabbed a couple of blankets. We were going to try to throw them over her head and tackle her. Throw. Miss. Run. Throw. Miss. Run. That plan failed too. Our next plan was to corner her, surround her and hope for the best. Darting here, darting there, she zigged, she zagged, she burrowed under plants. I think I even heard her say *beepbeep* when she ran past us a time or two. Finally, I don’t know what happened. But by pure luck or chance, we chased that girl right into our garage. I shut the door and she at least was in a confined space again. It didn’t take long. We squeezed ourselves around the vehicles, bicycles, lawn mowers. Harley got down on his belly and dragged her out, and stuck her in a box. We were tired and we were dripping sweat. Good bye and good riddance. But honestly? I had more fun chasing that chicken than I’d had in months! Despite the frustration and challenge, I laughed and laughed. The next day I was sore. Seriously sore. My inner thighs burned, my calves burned. It was a workout, y’all. As I rubbed my sore muscles, that’s when I got the greatest idea of my life. Chicken chasing—the next greatest and bestest fitness plan out there. The benefits are practically endless! Step aside Tony Little. Move over TaeBo and Salsa dancing. I’ve got a cardio workout for you. It’s going to be a sensation! I just have to find someone to sell this idea to. The next time you can’t sleep and you’re flipping through late night channels, don’t be surprised if you see me on an Infomercial promoting my workout plan. And that’s not all! Because you are one of my faithful blog readers, I’ve got a deal for you! If you want to be an early bird (get it? early bird?) and not wait for the infomercial, you can go ahead and send me 4 installments of only $29.99 each and reap the benefits today! Don’t wait!!! I know where I can find a chicken to chase!